While we’ve already started to see rumors of a OnePlus 6T, the existing OnePlus 6 is still the best the company has to offer. And, if you own a OnePlus 6 but no case, it’s probably time to get one, because the glass design introduced in this model is not quite as safe from drop damage as previous OnePlus phones were. There are plenty one OnePlus 6 cases that will still let you show off the great looks of your phone, and even more that can go a long way toward protecting your OnePlus 6 from all sorts of potential hazards, whether they be water or high falls. If you’ve been waiting because plenty of popular smartphone case manufacturers held out on making OnePlus 6 cases, don’t worry. We’ve found some good options anyway. Spigen's Rugged Armor case is a great combination of protection and affordability. It has a simple one-piece construction using flexible TPU to easily wrap around the phone and protect it from all sides. Covering the rear, save for a camera and fingerprint scanner cutout, this case will go a long way toward protecting the glass back of the OnePlus 6. Meanwhile, the raised edges can also protect your screen from falls onto flat surfaces. At $12.99 on Amazon, this is an easy pick for OnePlus 6 owners. 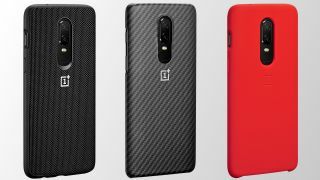 Otterbox has a great reputation for making smartphone cases, so it's always refreshing to see one available for a phone like the OnePlus 6. The Commuter Case combines a rubber cover that goes around the OnePlus 6 with a hard polycarbonate shell to add extra protection and keep everything in place. The case also has port covers, so when you're not using the ports, you can prevent dust and dirt from getting in. The Otterbox Commuter case may be expensive at $39.95, but preventing serious damage to your OnePlus 6 is well be worth that cost. Likely to maintain its title as the most affordable OnePlus 6 case around, Tudia's Arch S is no slouch in terms of build quality or looks. This model in particular is extra grippy and fits right around the curves of the phone to avoid any extra bulk that we commonly see with cases. You'll find access to ports and buttons unfettered by this case. Available in a few different colors, this one won't cost you more than $10, that's with shipping included. It’s about time that some cheaper OnePlus 6 cases hit the market, and it looks like Ringke heard the call with its Fusion case. This one comes in clear and black color options and provides a minimal, but comprehensive coverage around the latest OnePlus phone. Despite its minimalist design, it actually adds a bit of buffer space between the corners to protect it better against drops. The case also comes with a wrist strap in case you want to keep it strapped to your wrist but out of your hand. The OnePlus 6 is a dead-serious smartphone that’s packed with impressive specs for an appealing price, but Anccer says “lighten up a bit, will ya?” with a nice selection of color options for its Slim Fit case. From predictable favorites like black and silver, there’s also red, rose gold, blue and green to select between, among a few others. This one certainly isn’t as protective as a ruggedized option, but if you’re looking for a bit more pizzazz for your OnePlus 6, this is a good place to look. Looking for a classy add-on for your new OnePlus 6, the flip cover is the way to go. If you take a call, a little cut-out near the top allows you to hear the ear speaker easily while the case is closed. Flipped open, there’s a card slot where you can easily fit a few cards and a little cash. This doesn’t look like the most protective option around, but if you’re looking for a case that holds form and function in equal regard for $19.95 (£17.95). The most rugged option available through OnePlus, the Bumper case protects your OnePlus 6 from every angle and is available in a few different colors and build materials. Most stylish is the nylon, which gives your phone the soft feel of fabric. Ebony wood and Karbon will both appeal to certain crowds. This one goes for $24.95 (£23.95) and looks to be a worthy investment for your new phone. Available only in red, the soft silicone case is the perfect option for those who want to protect their phones with something simple in look and feel. Built to take a beating, silicone keeps your phone in one place on a surface and will likely age well, even if you get it dirty. This rather basic case offers easy access to all buttons and ports, and will cost you $19.95 (£17.95).